Soft Tech helps government organizations design, implement, and maintain critical information technology. Our team of highly successful and talented professionals delivers expertise and enterprise solutions while providing the highest level of service to our customers. Soft Tech is a woman- and minority-owned small business with contracts throughout the United States, including the DC metro area. 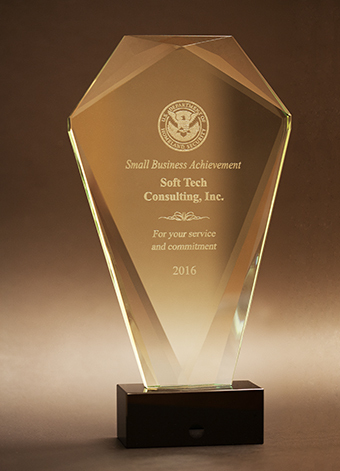 Soft Tech is the recipient of the 2016 Department of Homeland Security (DHS) Small Business Achievement Award. As one of just sixteen companies selected by the Department, Soft Tech is honored to be recognized for our outstanding work, service, and commitment in support of the DHS mission. The annual DHS Small Business Achievement Award recognizes exceptional contributions to the homeland security mission by a select group of small business firms from across the country. The award is sponsored by the DHS Office of Small and Disadvantaged Business Utilization (OSDBU) and includes nominations and substantial participation by the broader DHS procurement community and program offices in DHS components. Soft Tech is a woman- and minority-owned business headquartered in Chantilly, VA. Our team comprises highly successful and talented professionals whose mission is to help government organizations design, implement, and maintain mission critical information technology solutions. © 2018 Soft Tech Consulting Inc.